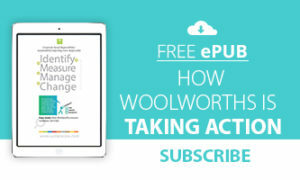 This case study is based on the 2015 Corporate Responsibility Report by Woolworths published on the Global Reporting Initiative Sustainability Disclosure Database that can be found at this link. Through all case studies we aim to demonstrate that CSR/ sustainability reporting done responsibly is achieved by identifying a company’s most important impacts on the environment and stakeholders and by measuring, managing and changing. With more than 3,000 stores in Australia and New Zealand that span food, liquor, petrol, general merchandise, home improvement and hotels, Woolworths aims to create a lively and inclusive workplace Tweet This! 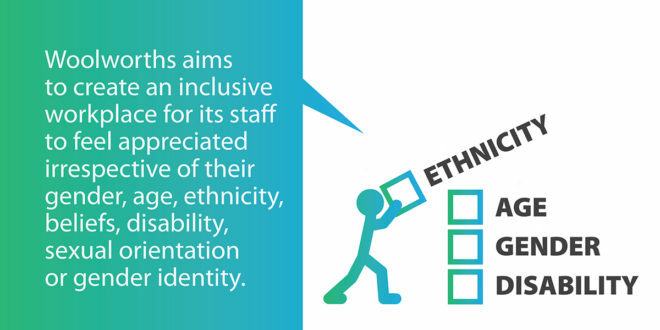 for its staff to feel appreciated at work irrespective of their gender, age, ethnicity, beliefs, disability, sexual orientation or gender identity. After measuring and setting targets, Woolworths took action to improve the representation of women in executive and management roles – in 2014, Woolworths reached its target to have 33% of leadership roles (within two levels below Woolworths’ CEO) filled by women –, create employment opportunities for indigenous Australians, support employees (or potential employees) with disabilities – Woolworths continues to support all of its potential employees by working closely with the Australian Network on Disability to ensure its new recruitment system is disability friendly – and, also, promote age diversity. In its 2015 Corporate Responsibility Report Woolworths identified a range of material issues, such as supplier relationships, communication and collaboration, end to end reduction of waste, labour rights in the supply chain, environmentally responsible sourcing, energy and emissions, product quality, safety, availability and range. Among these, as Australia’s second largest private sector employer and New Zealand’s largest private sector employer, employing 197,426 people in Australia, promoting workplace diversity stands out as a key material issue for Woolworths. With Woolworths’ original Sustainability Strategy drawing to a close, work has began on preparing a wider Corporate Responsibility Strategy through to 2020. To prepare this, Woolworths had an independent assessment carried out to review its key material sustainability issues. During the assessment, all of Woolworths’ business divisions and a wide range of external stakeholders were considered, including consumers, customers, employees, government, investors, peers and suppliers. Vital information was obtained through sources such as customer insights, employee surveys, strategic priorities and targets, the Advantage Report, traditional and social media reviews and industry sustainability benchmark indices. The issues were categorized as either ‘Material’, of ‘High Stakeholder Interest’, of ‘High Woolworths Interest’ or none of these. What actions were taken by Woolworths to promote workplace diversity? More than half of Woolworths’ workforce are women, Woolworths is committed to improving their representation in executive and management roles. In 2014, Woolworths reached its target to have 33% of leadership roles (within two levels below Woolworths’ CEO) filled by women, a year ahead of Woolworths’ commitment to the Australian Securities Exchange (ASX). Women hold 39% of management positions in Woolworths, with most of these roles based in operations. Increasing female representation at this level of management is vital in improving Woolworths’ overall gender equality in the business. Woolworths’ CEO, Grant O’Brien, is a member of the Male Champions of Change, a group of 22 CEOs committed to achieving change on issues related to gender equality in organisations and communities. As part of his commitment, Woolworths is implementing a new workplace flexibility program, WoWFlex, which currently involves more than 550 employees. This pilot program is focused on encouraging flexible work and is supported by a new flexibility policy and an activity-based working model. At Woolworths, the average gender pay gap is less than the average national gender pay gap. Woolworths does have more work to do, to close the gap. Woolworths is reviewing remunerations for a number of levels of employment, to spot gaps and to set suitable targets for improvement. In line with the commitment outlined in Woolworths’ Reconciliation Action Plan, Woolworths continues to focus on closing the gap between indigenous and non-indigenous Australians by means of employment strategies. To create the best employment opportunities Woolworths collaborates with external partners on community-based pre-employment programs. By means of a combination of soft skills training, in store work experience and ongoing mentoring, 84% of participants successfully reach 26 weeks of employment. Other pathways to employment are internships and the Graduate program. Woolworths continued its membership of the Business Indigenous Network, coordinated through the Business Council of Australia, which creates opportunities for greater participation of indigenous people in the workplace. Woolworths continues to work with Supply Nation, a body committed to growing diversity within the supply chain. In 2015 Woolworths supported two indigenous suppliers: Young Guns Container Crew, a Labour hire company and Message Stick communications. Supporting people with a disability to find employment continues to be a main concern for Woolworths. For example, Woolworths continues to support all of its potential employees by collaborating closely with the Australian Network on Disability – Woolworths continues to be a gold member of the Australian Network on Disability and its Group Head of Safety and Health is a member of its board – to ensure its new recruitment system is disability friendly. Woolworths is working to train employees in Auslan (Australian Sign Language), the language of Australia’s deaf community, to enable co-workers, supervisors and managers to communicate better with hard of hearing colleagues and customers. This work was championed by Drisana Levitzke-Gray, the Young Australian of the Year and Woolworths Workplace Advocate. With more than 74,000 of its employees under the age of 25, Woolworths provides many young people in Australia and New Zealand with a great start to their careers. Woolworths appreciates the experience of older workers, too, with more than 18,000 employees over the age of 55. Which GRI indicators/Standards have been addressed? Note to Woolworths: With each case study we send out an email to your listed address in request for a comment on this case study. If you have not received such an email please contact us.